These guys were very funny – for the time. Some people like them and some just don’t. This is all the information I have about their deaths. There is only minuscule information, for which I apologize. I do have the photographs though, thus the story. Oliver Hardy was the first to go. On September 12, 1956 – he suffered a stroke that left him paralyzed (they were planning a come-back at the time). He never regained the ability to speak, and required 24-hour care. He lived out the rest of his days at his mother-in-law’s house in Burbank. 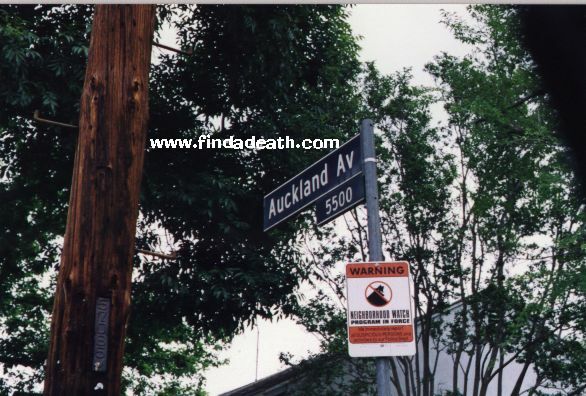 The house is located on Auckland Avenue. 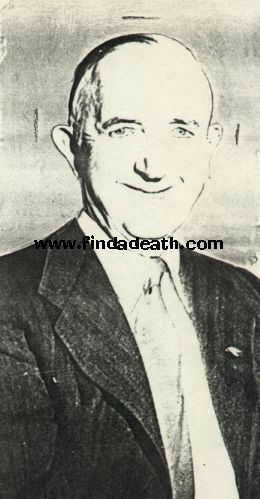 His widow, Lucille, was at his side when he died. 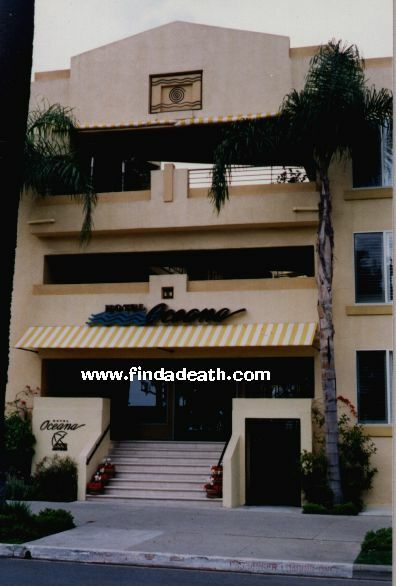 Findadeath.com friend Grant Brenna writes in: After Hardy’s first stroke he was unable to speak. 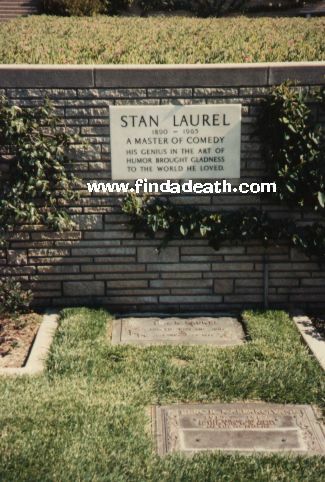 Stan Laurel visited him often and normally did not speak either. Rather, they communicated with each other and and amused one another with their hands and facial expressions. Naturally, they were adept at this as their silent film career depended on just such skills. 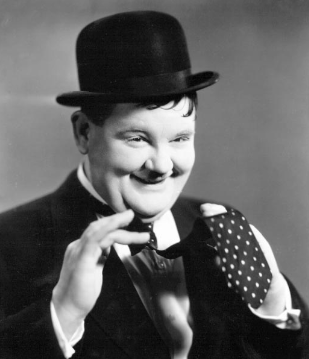 Oliver Hardy, you may recall, was an accomplished magician and had marvelous hand movements! 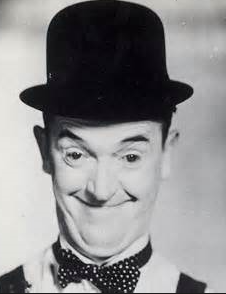 Upon hearing the news of his death, Stan Laurel stated, “What’s there to say? It’s shocking of course. Ollie was like a brother. 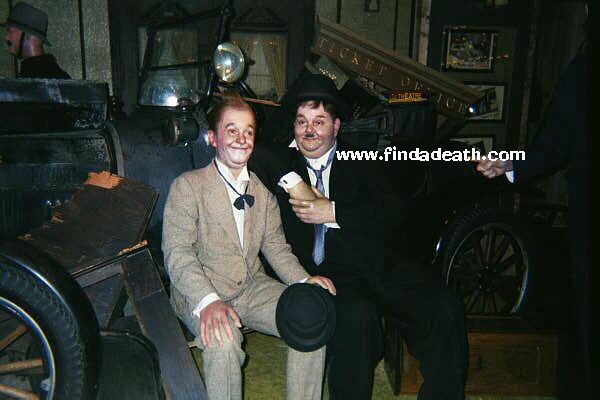 That’s the end of the history of Laurel and Hardy.” He was 65 years old. 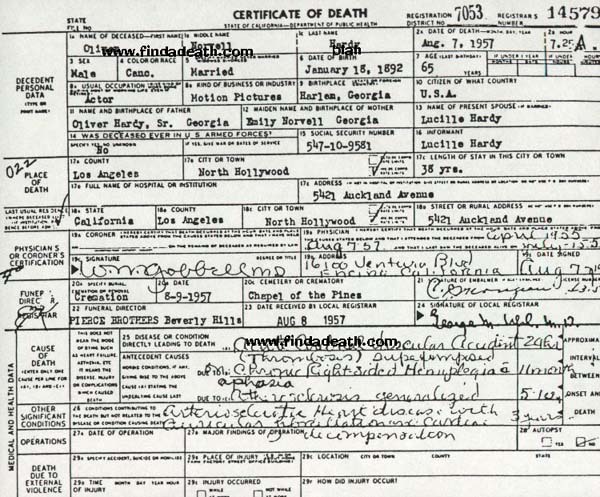 From the look at the cause of death on his death certificate – he was a mess. 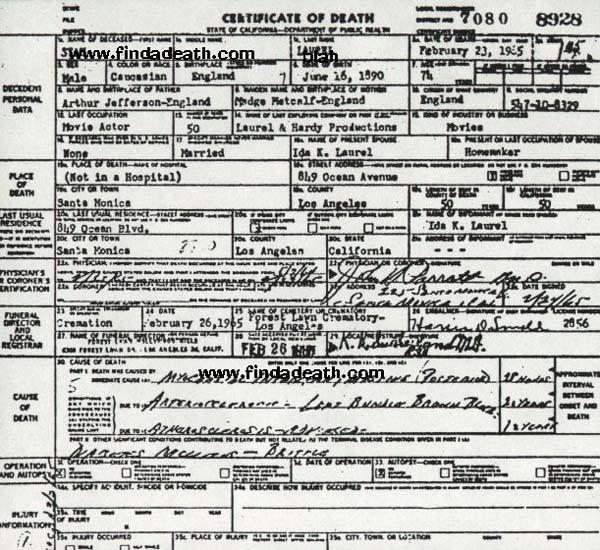 Findadeath.com friend Natalie sends us this input: “COMMENT ON OLIVER HARDY’S MESS AT DEATH – ALL THE DEATH CERTIFICATE TRANSLATES TO IS SUDDEN HEART ATTACK, BAD HEART, CLOGGED VESSELS AND BLOOD CLOTS CAUSING STROKES WITH RIGHT PARALYSIS AND INABILITY TO SPEAK.” Yep, sounds pretty bad to me. 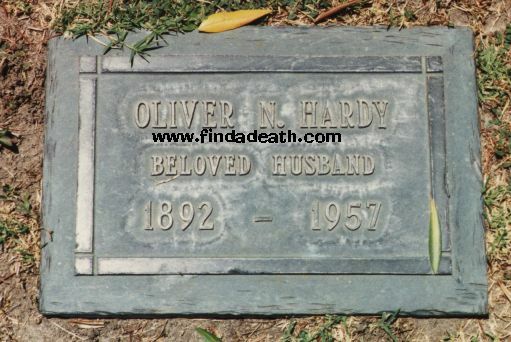 Oliver Hardy was cremated at The Chapel of the Pines, and is buried in Valhalla Memorial Park. 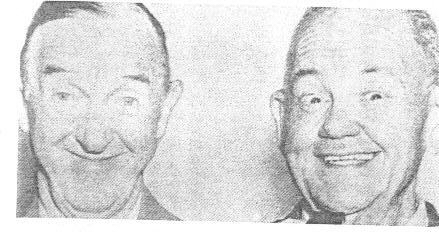 Stan Laurel had a stroke in June of 1955, and at the time of Ollie’s death, he was recovering well. He never made another public appearance after his former partner’s death. 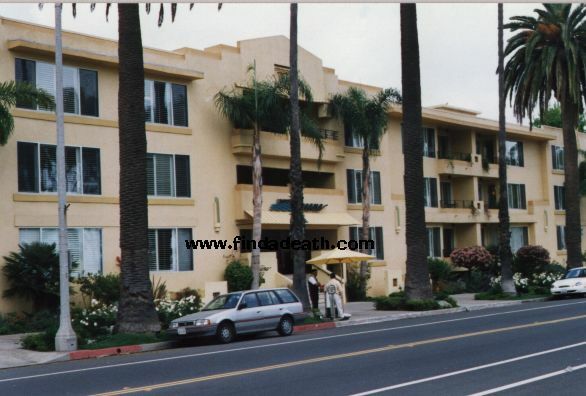 He was living in a three room apartment on Ocean Avenue in Santa Monica. 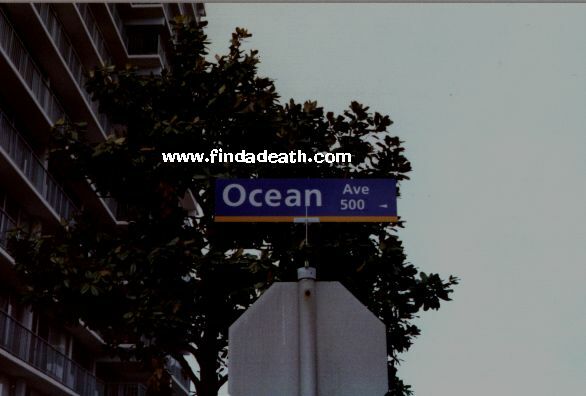 His building has been turned into a hotel, called The Hotel Oceana. On February 23, 1965 – Stan died of a heart attack in his apartment. His wife Ida was at his side. He was cremated, and is buried in Forest Lawn, Hollywood. Here is fascinating color footage and sappy music from Stan’s funeral. Trivia: Stan married 4 women, 8 times. You do the math. Remember The Music Box? In 1932 they filmed the comedy in which they were to deliver a piano to a home located at the top of a very long stairway. 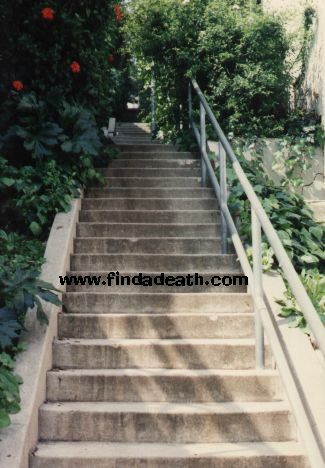 The stairs still exist, at 923-27 Vendome St. in LA. Findadeath.com friend Bob Willis sent this in: “The “piano on the stairs” scene you mention in the Laurel and Hardy story is one of the most famous directorial innovations in Hollywood history. If you saw the picture, you know that they had labored mightily to move the piano up a seemingly endless winding stairway leading to a house on top of a hill. When they finally get it up there, they pause for a break and both of them take their hands off the piano to wipe their faces with bandanas. They are in the forefront of the picture, facing the camera, the piano is in the background directly behind them. The audience sees the piano slowly start to move down an incline toward the stairs they have just wrestled it up, but the “boys” (as they were often called) are oblivious to the movement. The piano slides out of the screen shot (and the camera remains fixed on the faces of Laurel and Hardy) as the noise of its descent is heard. First a heavy thump, then the tinkle of a keyboard. Another thump, a sort of crashing sound, and then a slowly diminishing cacaphony of piano notes and splintering sounds as the piano goes down the lengthy stairway. All of this time, the camera remains in a closeup on the faces of Laurel and Hardy. It was the longest sustained shot of anyone’s face ever filmed (and I presume it still holds that record) and it was the first time that a scene of primary action was depicted by sound only. Alfred Hitchcock later used the device often, notably in Vertigo when he has the body of a woman fall from a tower and streak past the face of a man trying to climb a spiral staircase to reach her before she jumps. 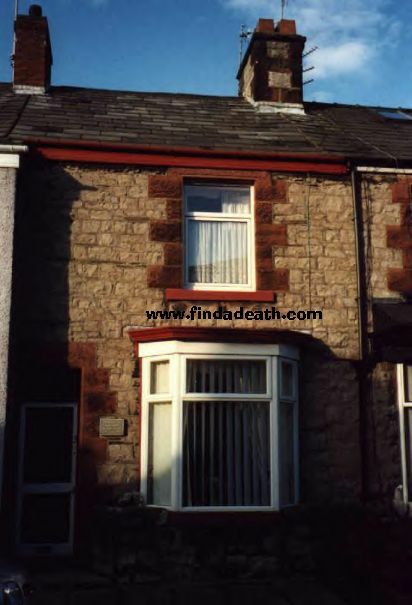 We see only a flash of the falling woman through a window behind the man, but the camera remains on the stricken face of the man as her screams and the thud of her impact are heard. 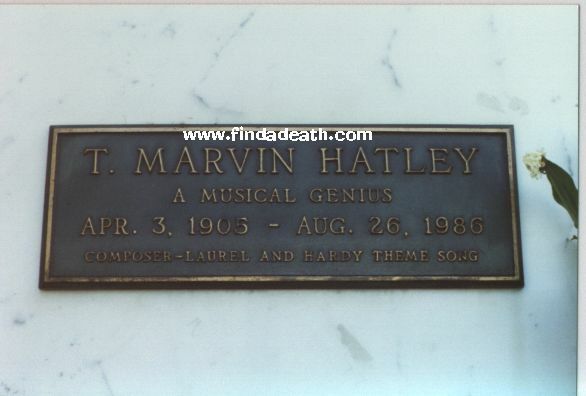 Trivia: The composer of the famous Laurel and Hardy theme song was T. Marvin Hatley. I haven’t seen many photographs of these two guys, in their twilight years, but I did scare up this one of Stan, taken in 1957. 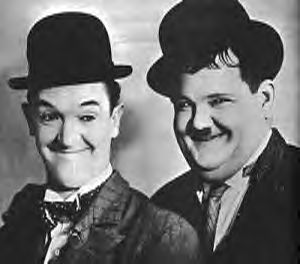 During the 1950’s, Laurel and Hardy made several plans to appear in television comedies, either as a regular series or a series of specials. Unfortunately, touring plans and the health of either Stan or Ollie prevented these projects from getting off the ground. Their only network TV appearance came on December 1, 1954 on NBC’s THIS IS YOUR LIFE. It was a surprise, unrehearsed appearance (which may or may not have miffed Stan a bit) during which friends and co-workers from The Boys’ past were trotted out for a series of teary-eyed, nostalgic embraces. The Boys are polite and charming throughout, though they leave most of the talking to host Ralph Edwards. 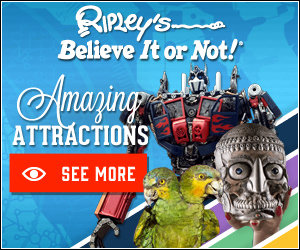 Some of the choices of guests may be questionable, but the appearances of Hal Roach Jr., Leo McCarey, Ida Laurel and Lucille Hardy were certainly appropriate. A fairly entertaining half-hour, and one of our few glimpses into Stan and Ollie’s off screen personas. Laurel hated how they cut their films for television. He had made an offer to the distributor to recut them for nothing, but they never replied. Laurel arrived in the United States on the same boat as Charlie Chaplin. Stanley Kramer offered Stan a role in It’s a Mad Mad Mad Mad World, but Laurel refused it, not wanting to “disappoint the kids” by his physical appearance. 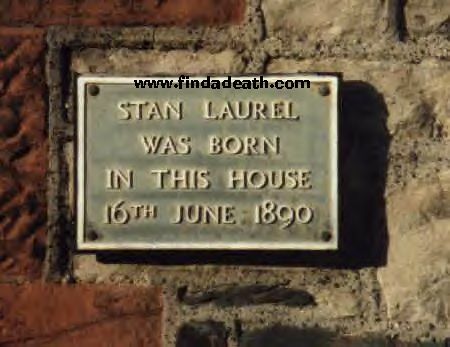 Just a note concerning your information about Stan Laurel. His daughter married actor Rand Brooks (Gone with the Wind and Corporal Boone on Rin Tin Tin) Still alive as far as I know. 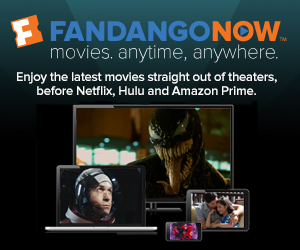 I just discovered your site and am enjoying browsing through it. I have a bit of info to add to the Stan Laurel file. Jim Mueller states that Stan arrived in the US on the same ship as Chaplin. This is so, but what’s not mentioned is that Stan was on that ship because he was Chaplin’s understudy for a traveling show. The two were also friends, and Stan used to tell a tale about them leaving their shoes outside their hotel room to be shined (as was done in English hotels), and awakening to find that the shoes had been stolen. They had to go to the theater that day in their slippers. 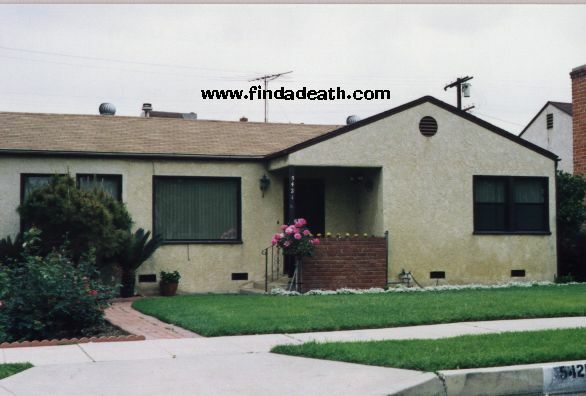 January, 2002: Findadeath.com friend Kieran sends these great pictures of the house that Stan Laurel was born in. Findadeath.com friend David Fowles sends this picture: It’s of their wax statues, from that awful wax museum on Hollywood Boulevard.